You’ve hired the international movers, and are ready to embark on the grand adventure of moving abroad. However, there’s always a pulse-pounding moment when you stop to wonder if you’ve lost your mind. What have you gotten yourself into this time? How can you even hope to keep your mental equilibrium through the massive changes of an international move? What does it take to build a life that’s authentically your own in a country that isn’t? Luckily, you’re not alone. There is a lively, worldwide expat community out there waiting to welcome you into its ranks and share hard-won strategies for thriving in a foreign land. I’ve been in Seville, Spain, since 2004, writing and blogging about the expat experience, and here are seven strategies that have helped me and countless others make a smoother transition to new life abroad. 1. Mentally unpack your bags. As soon as you arrive, make a conscious effort to let go of old habits and accept the way things are done in your new home, however loony or annoying they may seem at times. This can start with something as simple as resetting your watch and refraining from commenting, “Back home, it’s four in the morning now,” a statement that can only make you feel more tired than you already are. Looking forward instead of backwards will make it easier to embrace new customs and norms. People moving to Seville who work through lunch, refuse to take siestas, dine at seven and go to bed by ten have a very hard time joining the social life of the community. 2. Just say yes to all (reasonable) offers from locals. Bullfights are definitely not my thing, but when my landlady invited me to one, I agreed, had an amazing experience, and learned a lot about the role of toros in the local culture. She also talked me into joining her art class so I could meet other Spaniards, and not only did I form a lot of great friendships but I rekindled my interest in painting, which I now do on a professional basis. Obviously, you’ll want to politely decline invitations to participate in crimes, undesirable sexual liaisons, and acts of skullduggery, but try to take advantage of all legitimate offers. 3. Connect with the expat community. Some purists arrive in a new country determined to have the most authentic experience by living and socializing exclusively with the locals. This seldom lasts for long. It’s exhausting to speak another language all the time, and isolating to be with people who don’t understand the cultural context for your jokes. How do you find expats to hang out with? Even if you’re not normally a joiner, consider signing up for a club or class, or getting involved in an expat social networking group such as InterNations, which holds casual evening gatherings every month in more than 300 cities around the world. 4. Prepare to feel foolish while learning the language. Taking risks – and a few linguistic pratfalls – is essential to the learning process. 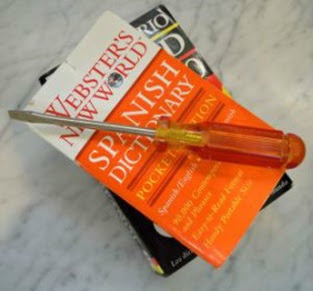 Early on, my husband and I arrived at a hardware store in search of a destornillador (screwdriver), but Rich blurted out that we wanted an “ordenador” (computer), causing such mutual confusion that we finally had to flee the scene without buying either a screwdriver or a computer. Not our finest hour, but test-driving your new skills in shops, cafes, and casual encounters is the best way to hone your skills (and your sense of humor). Take classes and ask the school to help you find someone who wants to learn English so you can meet for mutual practice. Don’t get exasperated if progress seems glacially slow. If you’re over thirty, you’ll likely need months for the basics, years to become fluent, a lifetime to work on your accent. Keep at it; the more fluent you become, the more enjoyable and comfortable your life will be. 5. Accept that you’ll always stand out as a foreigner. In a place like Spain, where locals tend to socialize almost exclusively with people they’ve known since baptism, you’ll probably never fully integrate into any group’s inner circle. But if you’re lucky and put some effort into it, you’ll form friendships with those locals who find foreigners interesting, and you’ll be included in the social round. My Sevillano friends may find me odd and incomprehensible at times, but they seem to enjoy my company anyway. Come to think of it, that probably applies to friends from my own country as well. 6. Adjust to local norms and attitudes. Take punctuality, for instance. Some of my Spanish friends consider it perfectly acceptable to arrive an hour late for a lunch date and don’t understand why anyone would get upset about it. Find out about local customs and the habits of your friends, and plan your social life accordingly. Include a few punctual Americans among your lunch guests so you’ll have someone to talk to while you’re waiting for the others. Be sure you have everyone’s cell phone numbers so you can check that they are merely late and haven’t forgotten the date entirely. When in doubt, consult Kiss, Bow or Shake Hands, a book on social niceties in business and social settings for 60 countries around the world. 7. Be open to new friends of all ages. This is especially important in the expat community. Most societies are highly stratified along generational lines, but when you live in a place with a limited number of English speakers, people of all ages are far more likely to intermingle. My close friends range in age from 20s to 80s. When I’m lucky enough to find people whose language, interests, and sense of humor are compatible with mine, I don’t really care what year they were born or whether their favorite band of all time is the Beatles, Hootie and the Blowfish, LMFAO, or Guy Lombardo and His Royal Canadians. I can go on for hours about this subject (just ask any of my friends) but I need to wrap up this blog post now. 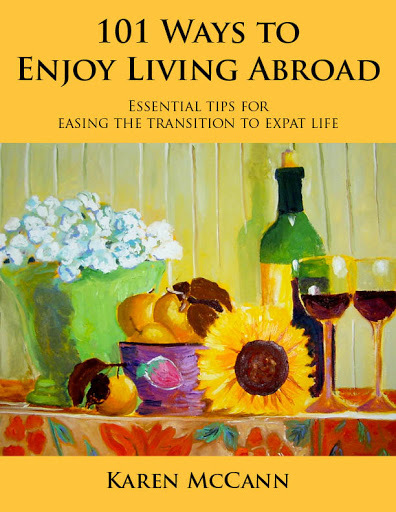 If you’d like more information, download my free booklet, 101 Ways to Enjoy Living Abroad: How to Ease the Transition to Expat Life. You can find it on my website EnjoyLivingAbroad.com, which also has a travel blog and links to lots more expat articles, blogs and websites. You might want to start with Expat Chat, Future Expats Forum, Exceptional Expats and The Professional Hobo. If you do decide to live abroad, remember that you’re not alone. Your fellow expats are here to suggest strategies, warn you against common pitfalls, and offer encouragement and support in countless ways. They’re as close as your ordenador. Or do I mean destornillador? 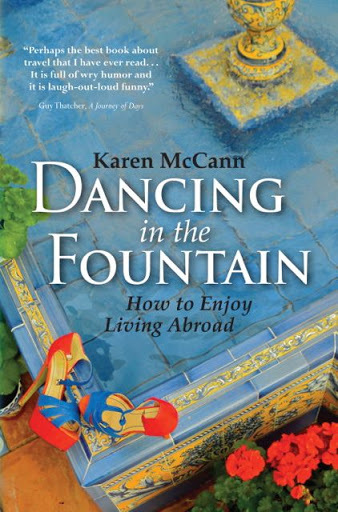 Karen McCann is the author of a book on expat life called Dancing in the Fountain: How to Enjoy Living Abroad, which reviewers compare to A Year in Provence and Eat, Pray, Love, and call “warm, inviting, immediately charming, and constantly entertaining.” An award-winning journalist, author, editor, food critic, artist and blogger, McCann has been living in Seville, Spain, since 2004. 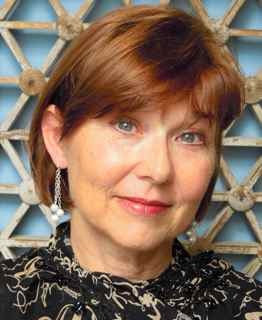 Wanderlust has taken her to more than thirty countries, including many developing or post-war nations where she and her husband volunteer as consultants to struggling microenterprises. A fourth-generation Californian, she lived in Cleveland, Ohio, with her husband for two decades before the couple moved to Seville “for a year” and decided to make it their home. Today, she spends her time writing, blogging, painting, exploring Seville, travelling the world. She makes frequent visits to California because America is something you have to stay in practice for, and she doesn’t want to lose her touch.